Graduate international student orientation begins Aug. 18; undergraduates begin Aug. 23. 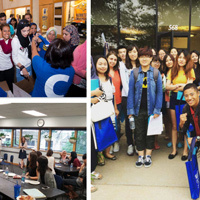 The Multicultural Center and International Student Affairs (MCISA) has been working hard to prepare for the upcoming arrival of new international students on the Webster Groves campus of Webster University. Our new class of students come to St. Louis from 28 countries all around the world. To extend our warm welcome, please familiarize yourselves with the schedule of events and resources available to help these new students when they first arrive. International students are already arriving and navigating campus resources, so please use these resources below to answer any questions about directions or locations of programs. Graduate orientation takes place on Saturday, Aug. 18. International student sessions are held from 12-5 p.m. after campus wide orientation in East Academic Building at 545 Garden. Students need to bring their immigration documents to complete required Immigration Check In. Undergraduate orientation takes place Thursday, Aug. 23-26 throughout campus. New students check in on Thursday, Aug. 23 in the University Center at 175 Edgar Road. International student sessions start with required Immigration Check In between 1-4 p.m. at the University Center Presentation Room and continue with a Welcome Dinner from 5-7 p.m. at the Library Conference Room at 101 Edgar Road. Thank you for helping our orientation staff extend a warm Webster welcome to our newest Global Gorloks!